Last week the New York Yankees’ biggest stars volunteered for their team’s Hope Week to benefit programs that help community residents most in need. Senior citizens were treated to manicures given by the pro athletes who joked and listened as the old-timers told their tales. 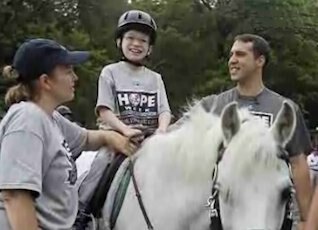 In another part of town, kids with special needs, like a boy with cerebral palsy, rode horses with their favorite Yankee players. “The easy way is to give money, but it’s the giving of time that I think is cherished a little bit more,” said baseball great, Derek Jeter.